The House Ethics Committee opened an investigation into Rep. Keith Ellison (D., Minn.) after he failed to disclose that a group founded by members of the Muslim Brotherhood paid for him to make a pilgrimage to the Islamic holy site of Mecca in Saudi Arabia. Top Democrats have considered shifting to the left by electing Ellison party chairman, but critics say his previous association with radical groups should disqualify him from the leadership role. Ellison has associated with the Muslim American Society, a Virginia-based group founded by Muslim Brotherhood members in 1993 to act as the "overt arm of the Muslim Brotherhood in the United States," according to federal prosecutors in 2007. The United Arab Emirates recently added the group to a list of terrorist organizations. In 2008, the society paid for Ellison, a practicing Muslim, to make a 16-day pilgrimage, known as the hajj, to Mecca. He was joined on the trip by Asad Zaman, who sits on the board of the Muslim American Society's Minnesota chapter. Zaman has contributed thousands of dollars to Ellison's congressional runs, both before and after the Mecca trip. Eight months after Ellison returned from the trip, the House Ethics Committee questioned why he did not disclose the amount of money that the Muslim American Society paid for him to take the trip, which qualifies as a gift to a public official. Following the committee's investigation, Ellison was told that he had to disclose that his trip cost the Muslim American Society $13,350. Ellison had initially said that he might have "meetings of an official nature" during his trip to Saudi Arabia, but told investigators that he "instead undertook only the more personal itinerary scheduled by the Muslim American Society," which he believed allowed him to keep the trip's cost private. At the time, Ellison said he was "not privy to the internal workings" of the Muslim American Society, but the trip took place years after it was revealed that the organization was founded by members of the Muslim Brotherhood. The Chicago Tribune published a lengthy exposé in 2004 about how the Muslim Brotherhood had operated in the United States for decades with a goal of achieving Islamic rule in America. Brotherhood leaders voted in 1993 to create the Muslim American Society to serve as the group’s public face in the United States. "When the leaders voted, it was decided that Brotherhood members would call themselves the Muslim American Society, or MAS, according to documents and interviews," wrote the Tribune. "They agreed not to refer to themselves as the Brotherhood but to be more publicly active. They eventually created a Web site and for the first time invited the public to some conferences, which also were used to raise money." An internal memo instructed members how to deflect if asked about their ties to the Muslim Brotherhood or its support for terrorism. "If asked, ‘Are you the Muslim Brothers?' leaders should respond that they are an independent group called the Muslim American Society. ‘It is a self-explanatory name that does not need further explanation,'" wrote the Tribune. "And if the topic of terrorism were raised, leaders were told to say that they were against terrorism but that jihad was among a Muslim's ‘divine legal rights' to be used to defend himself and his people and to spread Islam." A former member of the society who quit due to its "anti-American sentiments and its support for violence in the Middle East" told the Tribune that its leaders had a plan to "convert Americans to Islam and elect like-minded Muslims to political office" in the United States. "If the Brotherhood puts up somebody for an election, Muslims would vote for him not knowing he was with the Brotherhood," the man said. The society's leadership acknowledged at the time that the group was rooted in the Muslim Brotherhood, referred to as Ikhwan, but said it had since grown into something else. "Ikhwan [Brotherhood] members founded MAS, but MAS went way beyond that point of conception," a MAS official told theTribune. However, a Muslim Brotherhood official in Egypt said that being open about the Muslim American Society’s full ties to the Brotherhood would create "security inconveniences" for the group in the United States. "I don't want to say MAS is an Ikhwan entity," said the Egyptian official. "This causes some security inconveniences for them in a post-Sept. 11 world." 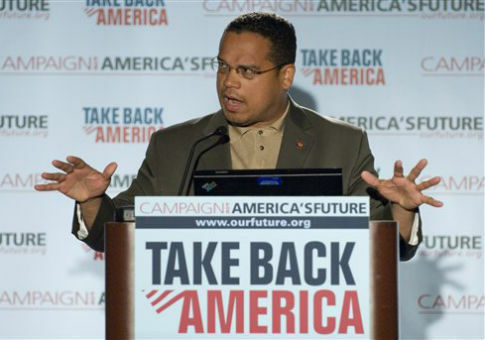 Kyle Shideler, director of the Center for Security Policy's Threat Information Office, said that Ellison should have known about the Muslim American Society’s radical roots at the time of his trip. "The Muslim American Society had been identified as an arm of the Muslim Brotherhood, both in reputable news reports like the Chicago Tribune as well as by the federal government, by the time Rep. Keith Ellison made his decision to accept the 2008 trip," Shideler said. "If we are to be charitable, at a minimum Ellison ought to have known the nature of the organization he was associating with, as even the most basic due diligence would have discovered it." Ellison's office and the Muslim American Society did not respond to numerous requests for comment. Ellison's involvement with the Muslim American Society was not limited to his one trip to Saudi Arabia. He was also the keynote speaker at annual conventions held by the society’s Minnesota chapter in 2007 and 2008. Mahdi Bray, who was the society's executive director at the time, celebrated Ellison's 2006 election to the House of Representatives, which marked the first time a Muslim was elected to Congress. Fox News reported that Bray took time off from his job with the society to campaign for Ellison's first election. Bray celebrated the news that Ellison was being considered to chair the Democratic Party. Evidence about the Muslim American Society's radical nature continued to emerge in the years following Ellison's trip. A member of the Muslim Brotherhood convicted in the United States for links to terrorism told federal prosecutors in 2012 that "everyone knows MAS is the Muslim Brotherhood." This entry was posted in Politics and tagged DNC, Keith Ellison, Muslim Brotherhood. Bookmark the permalink.